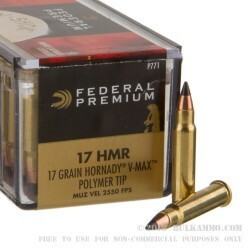 This Federal 17 HMR round is an ideal fit for small game and varmint hunting. 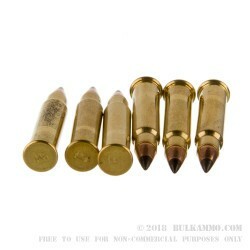 It is loaded with the Hornady V-Max 17 grain, polymer tipped bullet. 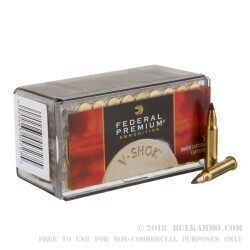 Hornady designed this bullet specifically to achieve a flat trajectory, maximum accuracy, and quick fragmentation. These attributes make this Federal round perfect for your next squirrel or fox hunt. 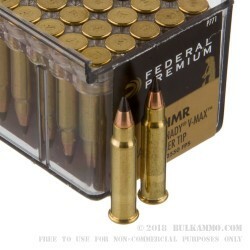 Federal Ammunition, one of the leading brands in American ammo, is a subsidiary of Vista Outdoor. Federal was founded in 1922 in Anoka, Minnesota, where it and its 1,100 employees still call home today. Now well into the 21st century, its reputation for quality manufacturing has never been better.